We want to accompany you in looking for your new home and help you in taking the best decision. Come to find your home at habitaclia! If you are an estate agent, habitaclia is the best shop window for your flats, houses, premises, offices and warehouses, etc. to reach those who are looking for them. We receive over 5,500,000 visits every month. We know how to advertise your properties on the Internet. More than 2,000 sector professionals advertise their flats on the portal. Our aim is to improve the house search process for users and to help estate agents to sell or rent faster and to be successful in their business. habitaclia is a large team of professionals who work together to offer the best service: computer technicians, designers and experts in marketing and Internet specialised in the real estate sector. We like our work and strive to do it professionally, honestly, effectively and resolutely. 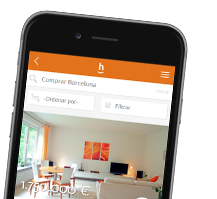 We want to make things easy for you in habitaclia. You can see we are not an estate agent’s, but rather a portal that brings estate agents, developers and individuals into contact with people looking to buy or rent a property. We have gathered the best property offer on the Internet for 14 years so that people looking for a home might find one best suited to their needs. Empathy, clarity and commitment to our customers and all of the portal’s users have always been the pillar of our company.